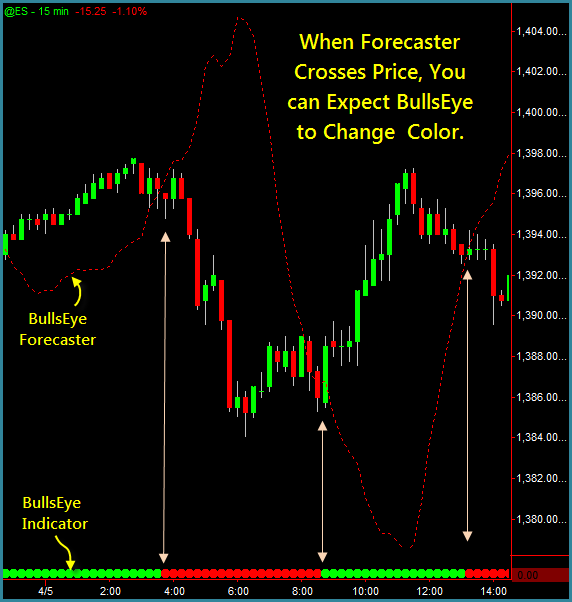 "The BullsEye Becomes a LEADING Indicator"
Use the Forecaster to See "in advance" when BullsEye will change color. 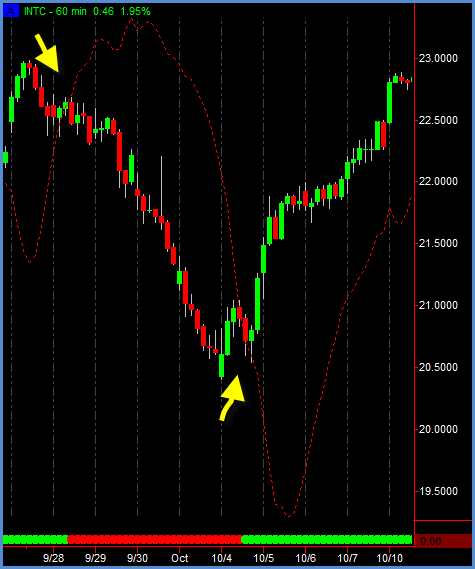 The Best Indicators are Always "Leading" Indicators! 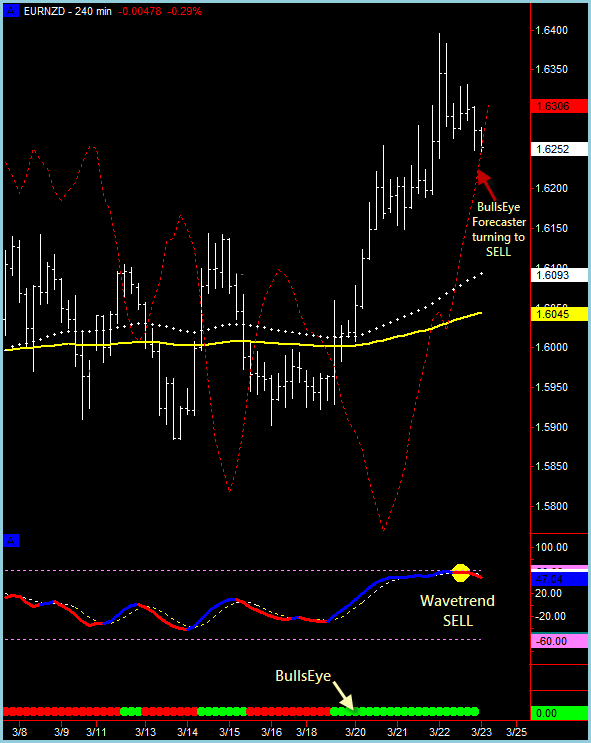 The Forecaster Can Get You into Trades ahead of Moves! 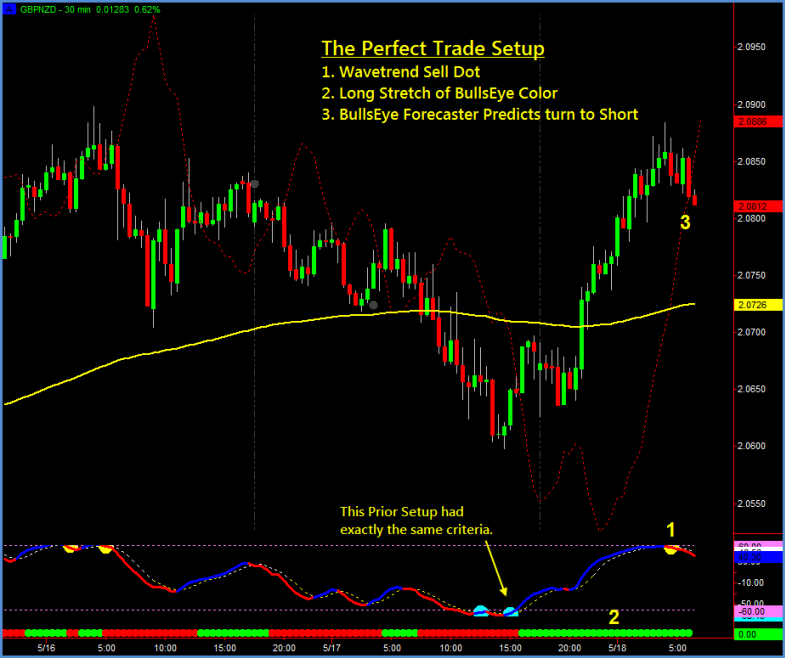 This is My Most Common Trade Setup and Most Profitable. for Price to Break Trendlines before Entry. 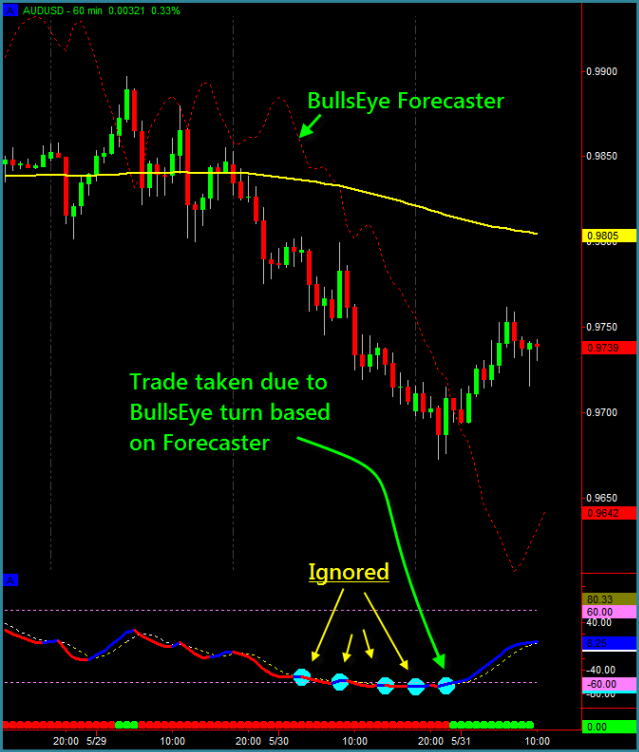 With the Forecaster, You Could Have Jumped On this Trade Two Candles Ago With Reasonable Assurance the BullsEye is Turning to a Bearish Sell. You Do Not Know How Long Until BullsEye Will Chance Color to Bearish Sell. 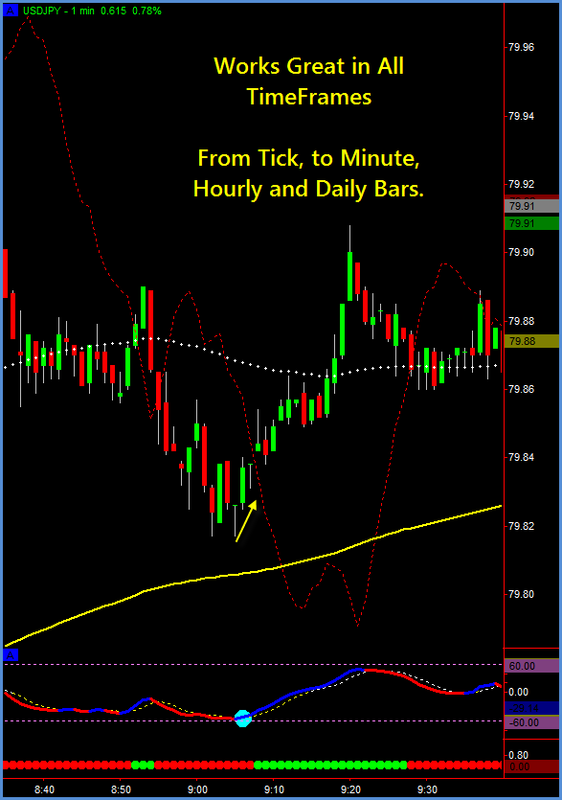 Depending on your timeframe, it can be Minutes to Hours before You Enter this Trade and You May Miss the Move by waiting. 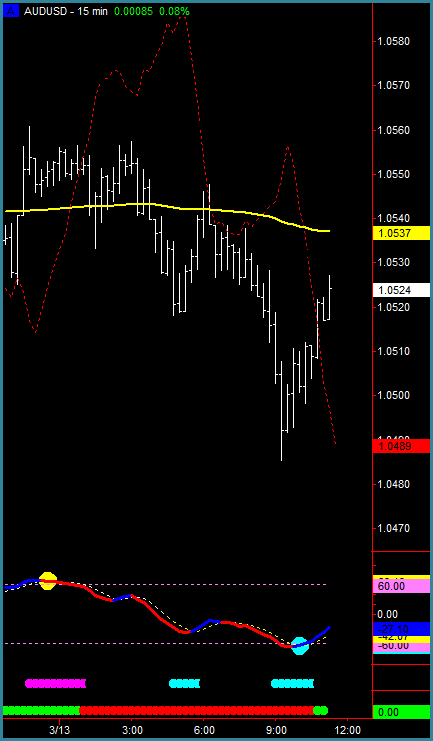 Here is a fairly typical tick chart of a day with the S&P E-Mini's. 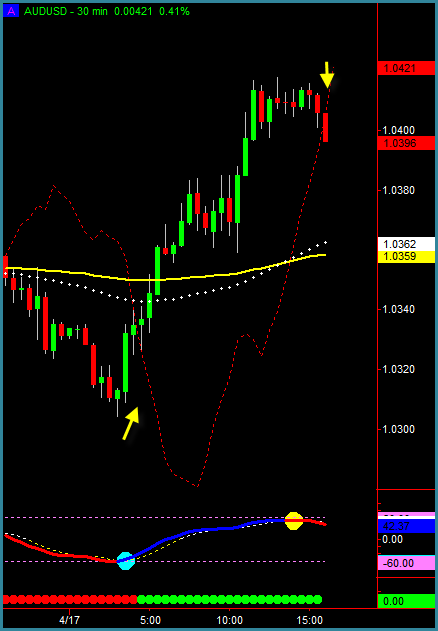 The Wavetrend/BullsEye still produced 3 Excellent trades. Look For BullsEye to Turn. 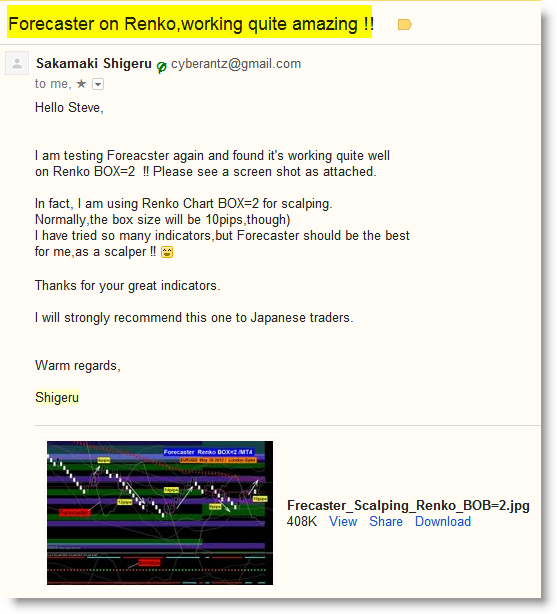 Use Forecaster to Predict. Enter Trade. 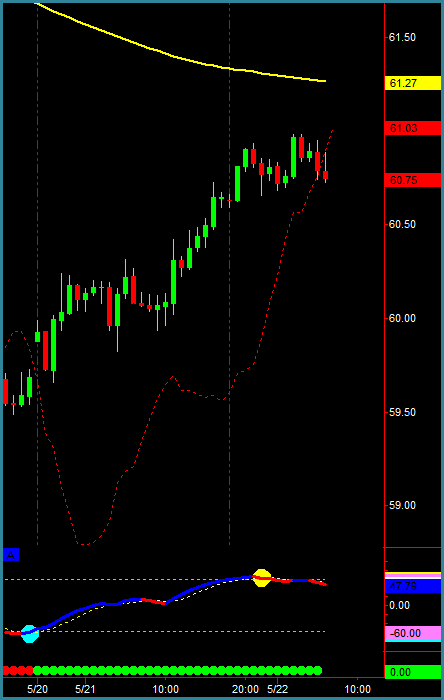 Place Stop Loss under/above recent swing high/low. Keep Target Open. 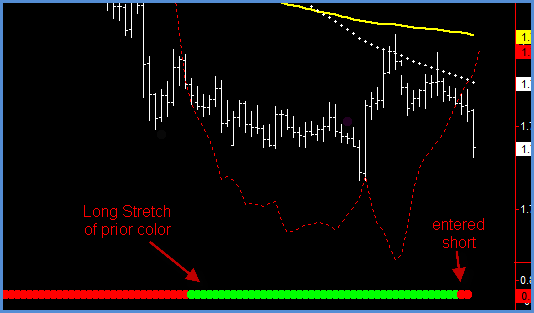 Exit Trade When BullsEye Turns Color Again. When Homeruns are Captured this Way!" YES Steve, I'm ready for BullsEye Forecaster. Hypothetical or simulated performance results have certain inherent limitations. Unlike an actual performance record, simulated results do not represent actual trading. Also, since the trades have not actually been executed, the results may have under- or over-compensated for the impact, if any, of certain market factors, such as lack of liquidity. 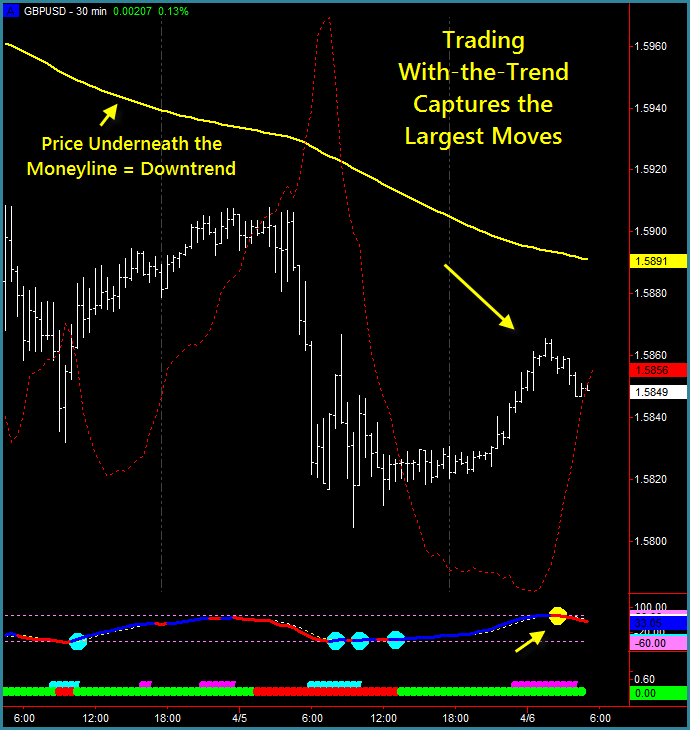 Simulated trading programs in general are also subject to the fact that they are designed with the benefit of hindsight. No representation is being made that any account will or is likely to achieve the profits or losses similar to those shown. ALL TRADING SYSTEMS OFFERED ARE PROVIDED FOR INFORMATIONAL AND EDUCATIONAL PURPOSES ONLY. ANY TRADES PLACED UPON RELIANCE OF THESE SYSTEMS ARE TAKEN AT YOUR OWN RISK FOR YOUR OWN ACCOUNT. PAST PERFORMANCE IS NO GUARANTEE OF FUTURE RESULTS. While there is great potential for reward when trading commodity futures, equities and foreign exchange, there is also substantial risk of loss in all trading. You must decide your own suitability to trade. Future trading results can never be guaranteed. This is not an offer to buy or sell futures, options or commodity interests. No claims as to past, present or future profitability of these systems are made, and there is no guarantee that the system will provide any profits to traders using the system, and indeed may cause such traders to incur losses. No representation is being made that any account will or is likely to achieve the profits or losses similar to those shown. The systems offered here are based on historical formulas which have worked in the past. However, what has happened before may or may not happen again. 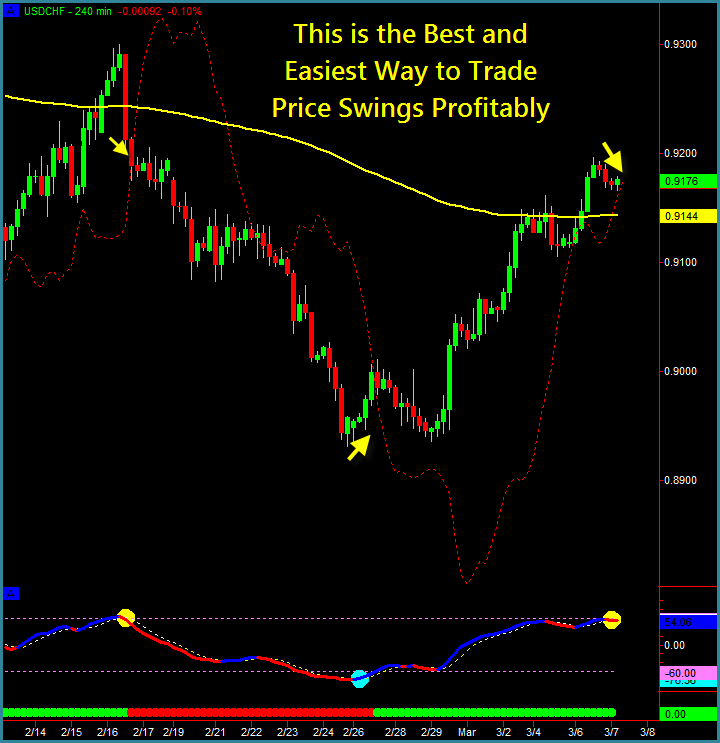 You can lose all your money trading futures, equities or foreign exchange and you must decide your own suitability as to whether or not to trade. Only trade with true risk capital you can afford to lose. Only trade markets you can properly afford to trade. Properly funded trading accounts typically perform better than those that are not. Never risk more than 3-5% of your account on any one trade. Stop trading a system if it doesn’t fit your trading style and find you cannot follow the signals. We are not CTAs. 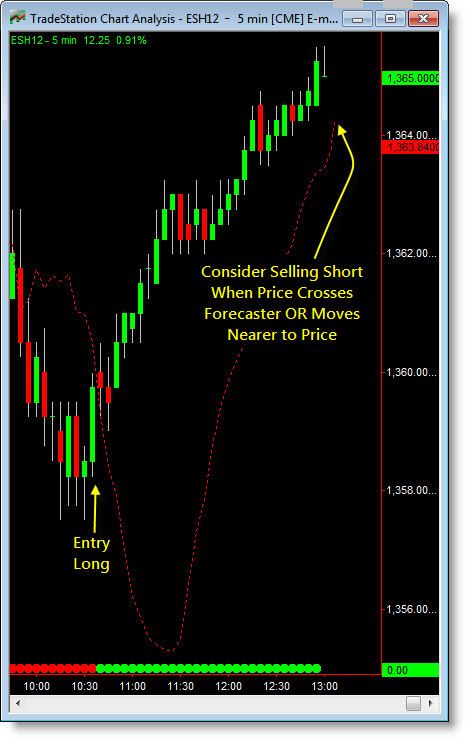 Becoming a customer of our trading systems presumes you have fully read and understood the risks involved in trading futures/commodities as set forth. THERE CAN BE NO ASSURANCE THAT ANY PRIOR SUCCESSES, OR PAST RESULTS, AS TO INCOME EARNINGS, CAN BE USED AS AN INDICATION OF YOUR FUTURE SUCCESS OR RESULTS. ALL TRADING INCLUDING EQUITIES, FUTURES, COMMODITIES, OPTIONS AND FOREIGN CURRENCIES HAVE UNKNOWN RISKS INVOLVED, AND ARE NOT SUITABLE FOR EVERYONE. MAKING DECISIONS BASED ON ANY INFORMATION PRESENTED IN OUR PRODUCTS, SERVICES, OR WEB SITE, SHOULD BE DONE ONLY WITH THE KNOWLEDGE THAT YOU COULD EXPERIENCE SIGNIFICANT LOSSES. 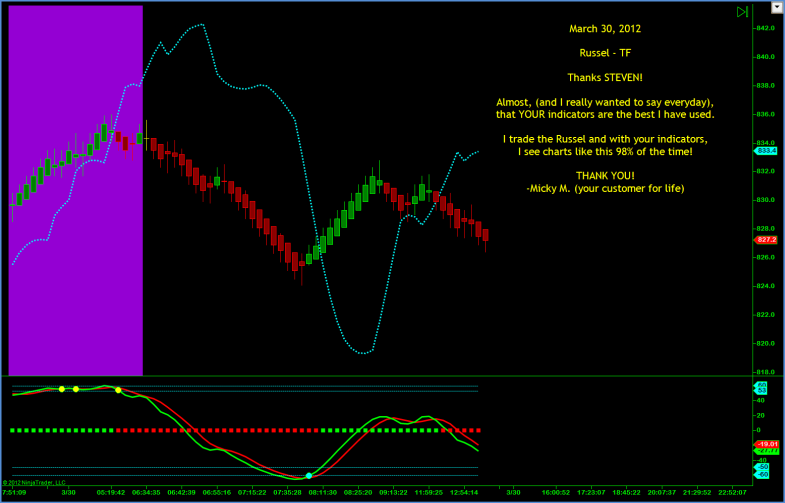 ALL TRADING SYSTEMS OFFERED ARE FOR EDUCATIONAL AND INFORMATIONAL PURPOSES ONLY. USE CAUTION AND SEEK THE ADVICE OF QUALIFIED PROFESSIONALS. CHECK WITH YOUR FINANCIAL ADVISOR, ACCOUNTANT, LAWYER OR BEFORE ACTING ON THIS OR ANY INFORMATION. USERS OF OUR TRADING SYSTEMS ARE ADVISED TO DO THEIR OWN DUE DILIGENCE WHEN IT COMES TO MAKING TRADING DECISIONS AND ALL INFORMATION, PRODUCTS, AND SERVICES THAT HAVE BEEN PROVIDED SHOULD BE INDEPENDENTLY VERIFIED BY YOUR OWN QUALIFIED PROFESSIONALS. OUR INFORMATION, PRODUCTS, AND SERVICES ON THIS WEB SITE SHOULD BE CAREFULLY CONSIDERED AND EVALUATED, BEFORE REACHING A BUSINESS DECISION, ON WHETHER TO RELY ON THEM. YOU AGREE THAT OUR COMPANY IS NOT RESPONSIBLE FOR THE SUCCESS OR FAILURE OF YOUR DECISIONS RELATING TO ANY INFORMATION PRESENTED BY OUR COMPANY, OR OUR COMPANY PRODUCTS OR SERVICES.